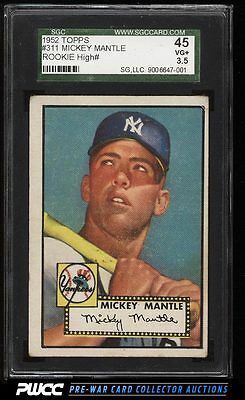 The single most important post-war card in the entire hobby and a special investment piece in collectible condition. The offered VG+ example shows even corner and surface wear to account for the grade, and is pleasingly free of major wrinkles or creases as are so common on other example in similar condition. All told this presents nicely and is worthy of serious consideration. Part of an extensive run of '52 Topps on the auction block this month; nearly the entire set is offered within various grades. One of nearly 20,000 cards, lots, and sets up for bid in our 7th Auction of 2016. Click on the link above to view the other PWCC auction lots.